Sunday, April 17, 7 p.m. Cloud Cult is an ethereal-sounding name, and the band can be by turns dreamy, lush and even philosophical. But they are also, in their own way, down-to-earth and direct. Perhaps that is a result of their concern for the planet, which extends to ecological practices in their recording and touring. The Duluth, Minn.-based experimental indie band was founded by singer-songwriter Craig Minowa more than 20 years ago, as a solo studio project after the sudden death of his 2-year-old son. By the time of Cloud Cult's third album, They Live On the Sun (2003)—released on Minowa's Earthology label, which reached No. 1 on college radio charts—the 40-year old with a B.A. in environmental science "was getting pressure to create an actual band." 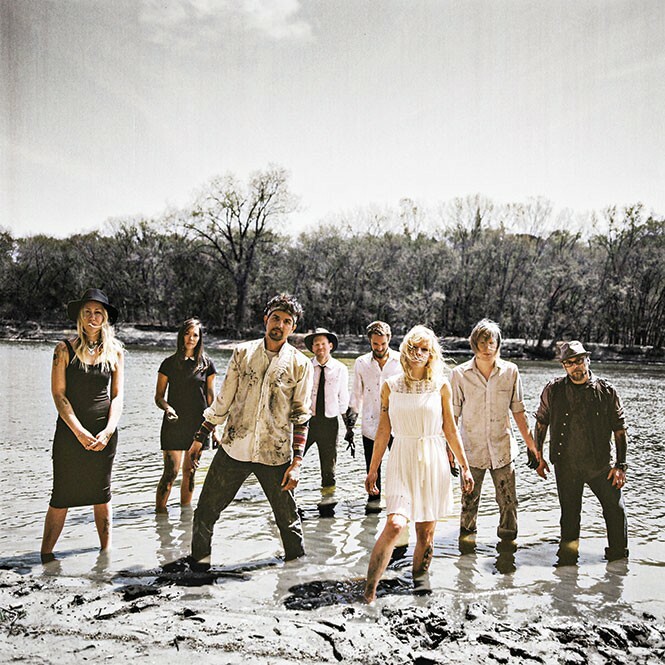 Cloud Cult became a trio, later expanding to a sextet and, now, an octet. Earthology—the studio and the band's philosophy—is the heart of Cloud Cult. They take it extremely seriously. The studio, built on Minowa's organic farm in Wisconsin, has solar panels. All of their products are manufactured with 100 percent organic, recycled or post-consumer recycled materials. The large band also tracks its carbon footprint in all aspects of their work—and takes steps to erase it. "We figure out how much CO2 we put out, for everything from the energy we're using on stage to traveling in airplanes, and we figure out how many trees we would need to plant to absorb all of that," Minowa says "So, we plant a few hundred trees every year." And, although Minowa is proud to say the band is "completely off the grid," Cloud Cult isn't above helping sustain it: They buy sustainable energy, created mostly via wind turbines on Native American reservations, to put back into the grid. Minowa notes that, early on, it seemed "cultish" to be environmentalists, and it caused prospective listeners to make judgments about the band, especially in their early days. "Back in the early 2000s," he explains, "it wasn't very trendy, and when people heard that, they assumed we were some kind of hippie jam band, or a really preachy folk band, or something like that. There were a lot of stereotypes [formed] about what it meant to be an environmentalist and a musician. But over the years, the green trend has really taken off, and those stereotypes don't seem to be applied anymore." Cloud Cult busted through the haze of labels with their music, racking up an impressive list of critical plaudits. Aurora Borealis (2004) was nominated for Album of the Year in the Minnesota Music Awards, alongside Prince and Paul Westerberg. The notoriously stingy Pitchfork rated Advice from the Happy Hippopotamus (2006) highly, and The Denver Post included The Meaning of 8 (2007) in its top 10 albums of the decade. Their next one, 2008's Feel Good Ghosts (Tea Partying Through Tornadoes) led MTV to make a short feature about the band. The following year saw the band release a full-length documentary film, No One Said It Would Be Easy: A Film About Cloud Cult. Demonstrated in a song like "There's So Much Energy In Us," from the album Light Chasers (2010), the band's genius is in being able to synthesize all the energies swirling around this cloud chamber of an ensemble. Another reason Cloud Cult avoids being a gimmicky miasma, staying grounded while its songs often gaze skyward, is its multimedia approach. In addition to its multi-dimensional sound, blending genres from classical to rock to folk, Minowa's wife Connie and artist Scott West—in addition to providing backing vocals—each create a painting to be auctioned off at the end of the night. And, with their newly released 10th album, The Seeker, the band moves into narrative feature films. Once again defying stereotypes and sidestepping genre boundaries, The Seeker also provides the plotline for a movie of the same name, starring Josh Radnor of the TV show How I Met Your Mother. "We started working on the album about two and a half years ago," Minowa says, "and I didn't realize that it was a storyline until early 2015." He wrote a treatment for the film, which follows a woman who experienced hard losses at a young age and became "a little cynical," but is led on a new path by "something from the past." Slated for release later this year, The Seeker symbolizes Minowa and his Cult's musical journey as it has expanded and evolved—and is still not without its difficulties. Now that Minowa has two young kids (ages 4 and 6), it's getting harder to go on the road, so he is considering switching to fly-out tours. It's hard to say how that will impact the band's carbon footprint, but it will change one thing, primarily for Utah fans who seek to see Cloud Cult live. "Unfortunately, it ends up altering the kinds of cities we can visit," Minowa notes. "This might be the last [time] we're in Salt Lake for the foreseeable future."